Helium (4He) is the second most abundant element in the known Universe (after hydrogen) but only makes up 5.2 parts per million (ppm) of the Earth’s atmosphere. Helium-3 (3He) is an isotope of helium with two protons and one neutron. It is not radioactive and very rare on Earth (7 parts per trillion) but exists in recoverable concentrations in the lunar topsoil (in the top 2 -3 m of lunar regolith). It is even more abundant on the gas giants Jupiter, Saturn, Uranus and Neptune. 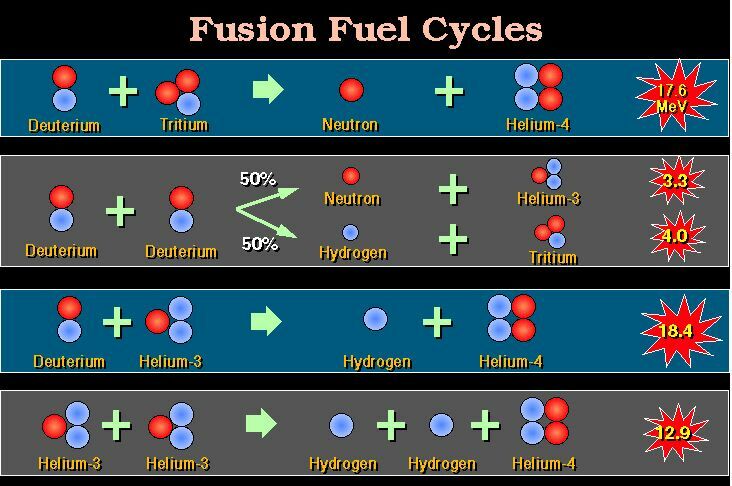 In fusion reactions neutrons are “nasty”. They are very hard to contain and make other materials radioactive on collision. The first generation fuels of Deuterium and Tritium (reactions 1 and 2 below) produce many neutrons. A second generation with Deuterium and 3He only produces a few. A 3He – 3He reaction would produce none. Kulcinski: Fusion Energy could provide that new energy source in the middle of the 21st Century. ….. However, …… the DT Tokamak does not appear to be the ultimate answer. The problem lies in both the DT fuel cycle, which emits 80% of its energy in highly damaging and radioisotope producing neutrons, and in the complex design of the Tokamak. But the promise of having 3He available to produce power is immense.